This entry was posted in celebrations, Church, conversiion, Felicians, Gospel, Jesus, MINISTRY, Pope Francis, Spirituality, vocations on February 3, 2019 by CSSF. 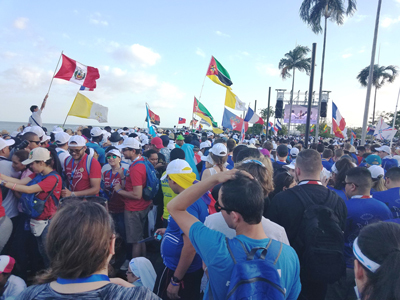 S Judith Marie Blizzard, S Desiré Anne-Marie Findlay, and Caroline Stanfill, program outreach coordinator, spent their first full day in Panama for World Youth Day on Tuesday, January 22. Sister Desiré said, “Even after a difficult night on the bus and a whole day on our feet, it seems we are all very energized by the kindness we are experiencing in Panama. 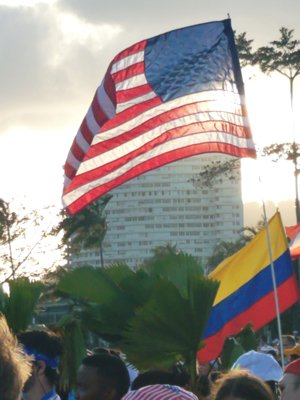 People call out Bienvenidos a Panamá! (Welcome to Panama) from their windows while countless cars honk and drivers happily extend the same greeting. This entry was posted in Church, conversiion, Felician, Felicians, Gospel, MINISTRY, reflections and tagged FAITH, life, News, Panama, religion, students, World Youth Day on January 25, 2019 by CSSF. Felician University’s Campus Ministry Office and Mission Office are offering Advent Reflections composed by students, faculty, administration, staff, sisters, and alumni. cut through all the barriers of rank and race. share God’s breadth of vision. This entry was posted in Advent, Christmas, Church, conversiion, Felician, Felicians, Gospel, Jesus, scripture on December 4, 2018 by CSSF. Blessed Mary Angela, our Foundress, in her proclamation of Mary as Mother and Lady of our Congregation, offered to us this heroic woman of faith as a model and mother. Mary’s faith journey and her role as the first among the faithful challenge us to a radical following of Jesus as women consecrated through our profession of the evangelical counsels. On November 21, 1855, Sophia, who was now known as Mother Angela, decided to consecrate herself totally to God and forged a new religious community steeped in the values and ideals of Saint Francis of Assisi. Sophia Camille Truszkowska, later known as Mother Mary Angela, was born in Kalisz, Poland, on May 16,1825. Sophia’s parents provided her with educational opportunities to which her keen mind responded eagerly. As a child and adolescent, Sophia was drawn to prayer and genuine compassion for others. As a young woman, she devoted herself to working for the poor and needy. Her spirituality was strengthened by a deep passion for Jesus in the Eucharist, a tender love for the Blessed Mother, and devotion to St. Francis of Assisi. On November 21, 1855, as Franciscan tertiaries, Sophia and her cousin knelt before the icon of Mary and dedicated themselves to do the will of her Son. For the Felician Sisters, this day became the founding day of the Congregation. Every aspect of the life of Mother Mary Angela, Foundress of the Felician Sisters, reflected her concern for the spiritual growth of all people and care for their temporal needs. Her mission was sustained by her selfless love of God and desire to do his will. She was scarcely forty-four years old when she withdrew from active leadership in her Congregation due to increasing deafness. For thirty years until her death on October 10, 1899, Mary Angela Truszkowska accepted her physical sufferings and interior trials as the final and most complete resignation to the will of God. The Church acknowledges the sanctity of her life. This entry was posted in Angela, Blessed, celebrations, conversiion, feasts, Felicians, HUMAN DIGNITY, Mary, MINISTRY, prayers, reflections, Saints, Spirituality, vocations on November 21, 2018 by CSSF.